The floor of my shop (garage) is sloped towards a central drain, which creates some interesting leveling problems. 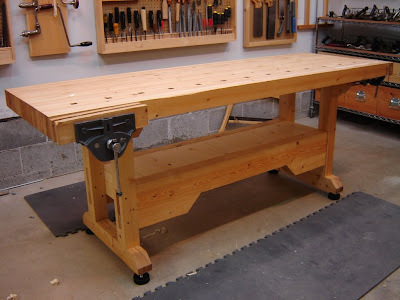 A couple of years ago, I decided that my system of using shims to level my bench just wasn’t cutting it. Too much moving around and re-leveling. 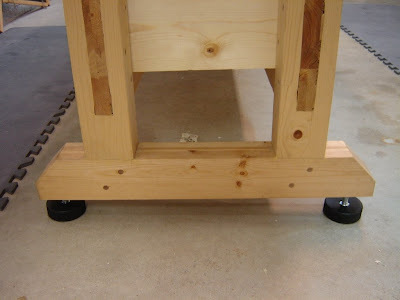 What I wanted was some system of leveler feet that would be easy to adjust and have good grip. All the locally available options where doubtful – either way too wimpy or too slippery looking. I decided to try to figure out how to make some. Thanks Angelo! I liked the beefiness factor and it sure seemed like it would grab the floor and not slide around. I decided to make my own, but as always I followed my motto: “Why leave well enough alone, when you can mess with it!” Now, this usually results in my making things way too complicated and much longer to finish – sort of like my infamous driving “shortcuts” (which, bowing to pressure from more time-oriented observers, I have renamed “super secret back ways”). However, in this case, I think I actually improved on the design – at least for me. The first major divergence from Angelo’s design was not drilling all the way through the puck. In the comment by Bob included at the end of article, he mentions his idea of just drilling a hole deep enough to seat the head of the bolt. I liked how this left more “meat” to support the weight of the bench, and I didn’t mind the puck not being firmly attached to the bolt. 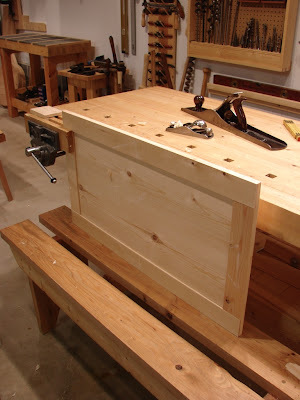 The second change simplified how the bolt attached to the bench. I decided to see how things worked if I just fit the bolt into a snug hole in the bench foot rather than screwing into an inset coupler. Mostly this was because I didn’t feel like flipping the bench over to bore a larger hole and I already had ½” holes in the bottom of the sled feet from the existing wooden shoe. I've updated the library link (click on the "View My List-O-Books" link in the left-hand nav bar - or just click here). I had a few new books to add, a few to remove (lingering powertool content) and I decided to indicate favorites. The books with titles in bold are my favorites - based on various criteria. Some are favorites based on - well, being my favorites! I go back to these books again and again and just reread for pleasure as well as learning. Others I don't read much anymore, but they played a pivotal role in my development as a human-powered woodworker (aka: Neanderthal) and thus hold a special place in my heart. Anyway, I am planning future posts on specific books, but who knows when that will happen. 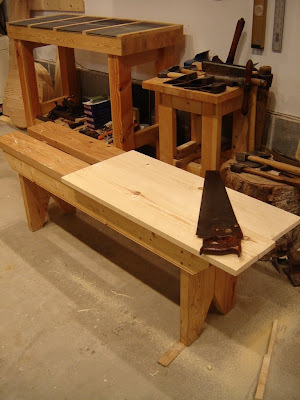 In the meantime, if anyone wants more information, review or opinion on any book in the list, just let me know - I am always happy to talk about books, especially woodworking books! 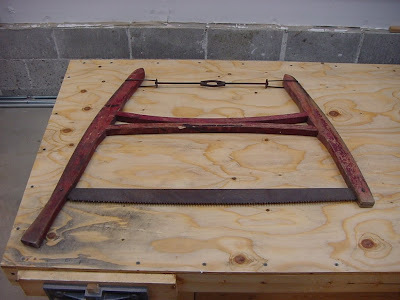 Anyway, a while back I wanted a bucksaw. Why? 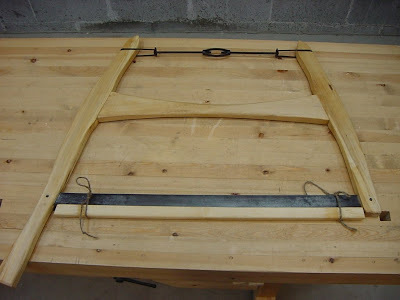 Well, the wooden bucksaw would be for bucking wood on a sawbuck. You just gotta love English! The only problem was that the vintage ones I could locate all had similar problems that made their further use unlikely - but as I was told on at least three different occasions "That would look great handing on the living room wall!" (Blasphemy! 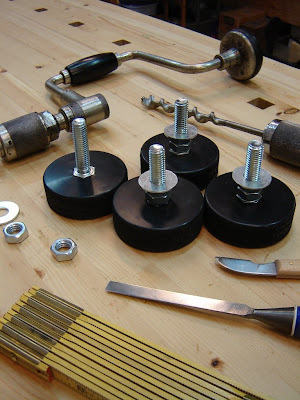 Tools are for using, not decorating!) But really, bucksaws are very cool. 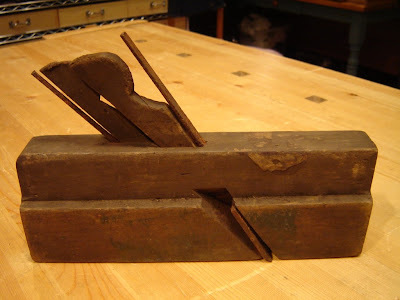 They are wonderful contraptions of wood and metal, and loose mortice and tenon joints, that balance the physics of leverage, compression and tension. 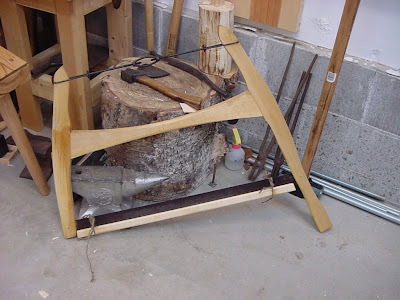 I finally realized that I was going to have to make my own - but in order to keep things simple, I decided to salvage the blade and hardware from an existing saw and just rebuild the wooden frame, using the original parts as models - a direct, and therefore simple, fast process. Yeah right. Like I could ever do that. So, as was inevitable, I decided to "improve" on the design. The first problem was easy to fix. 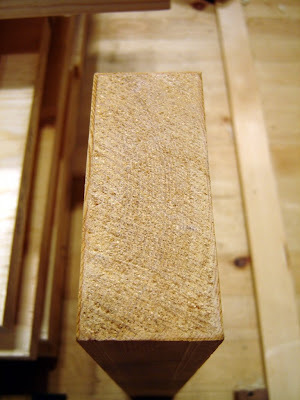 I just selected my stock (local birch) to allow for layout with the grain running the full length of the arms. 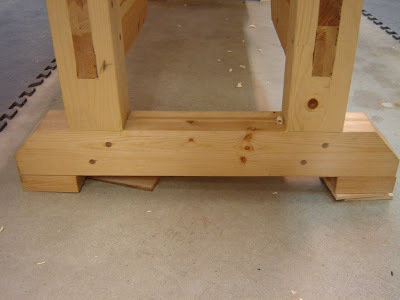 The second problem I solved by replacing the two-part stretcher with a solid one piece design. No hole; no weak point. As a bonus, I only had to chop two mortices instead of four. Side note: The small spray bottle is full of bleach water - as the chopping block (aka: birch stump) sat on the concrete floor it would mold on the bottom. A quick spray from time to time took care of things until the stump finished drying out. 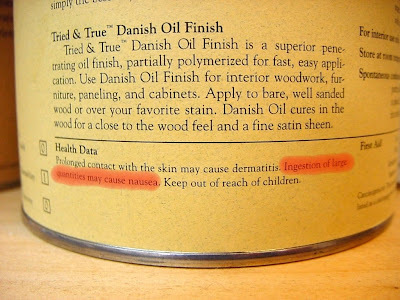 I've mentioned my love of Tried & True Danish Oil in an earlier post. Now I'd like to explain why I love it so much. It really IS boilded linseed oil. The boiling polymerizes the oil (at least partially) and decreases drying time. 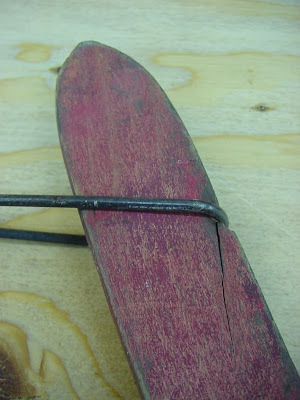 Apparently, this technique eventually became synonomous with "fast" drying lindseed oil. Today's shelves are full of "boiled" linseed oil, but they are really lindseed oil with metalic driers added to make them dry really fast. Which is great, if speed is all important. But I kinda of like my health, you know? And these metalic driers are bad. 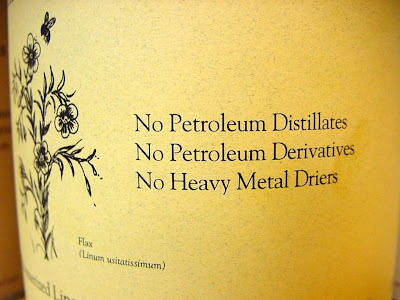 And so are the mineral spirits that are also in these "boiled lindseed oils". Sounds good, right? 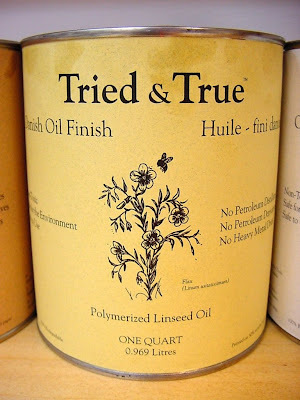 But to truly appreciate the difference let's take a closer look at the back labels of Tried & True and that other famous Danish Oil. Hmm, not that I was ever planning on taking a swig, but I think it gets the point across. 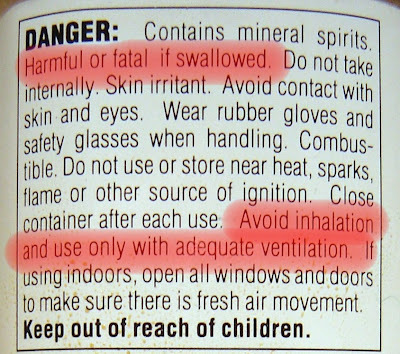 Just in case you can't read that, it says: "Ingestions of large quantities may cause nausea." Yeah, I'd say that is just a tad safer. So, Tried & True is traditional, I like the way it looks, feels and smells. It is clearly safer for me and for whomever receives my creations - I believe it is food safe in both wet and dry states. Tried & True does dry slower, but if you actually READ the instructions (most complaints I've seen make it obvious that they did NOT follow the instructions - you apply this stuff thin, not "flood and soak") it is not too bad. 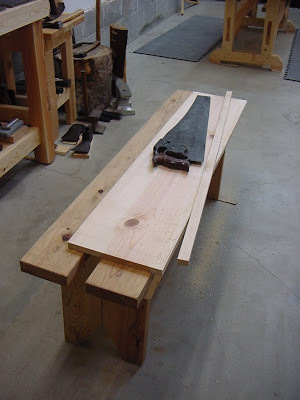 Besides, if I thought speed was what it was all about, I'd still be running wood through my old Delta table saw and Dewalt planer instead of using vintage Disston handsaws and Stanley planes. If you care about your health, and the health of the environment, like traditional approaches to woodworking, and don't mind rubbing on a few additional thin coats and waiting a while for it to fully cure - then I highly recommend Tried & True Danish Oil (and their Original Wood Finish and Varnish Oil too). Now, you might think I am crazy after this. I am not sure I can really explain, but I will give it a shot. For me there is something very powerful and enjoyable about bringing old tools back to a usable state. The interesting part is, that to a large extent the joy is based on the change in status of the tool itself, not in my possession of it. I know it is a little strange (okay, a lot strange!) but I feel like the tool is "happier" somehow. Yup, I knew this was going to be hard to explain, and before you get too worried about my mental state I'll try to clarify. Maybe "happier" isn't the right word - maybe "at peace" is closer to what I mean. Yup. Now that's better isn't it? See, I'm not mental. Okay, one more try and then I'll let it go for another time. I guess I get satisfaction out of returning some kind of order to chaos. 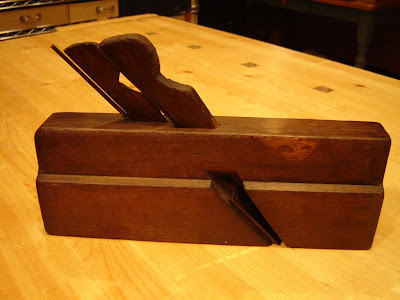 The tool was originally just raw materials, that someone imposed an order into and created a higher ordered state - a usable tool (which, interestingly enough, was used to impose further order on further raw materials...). Over time, and with lack of care, poor environment etc. the order was lost and the tool begins to become unusable. 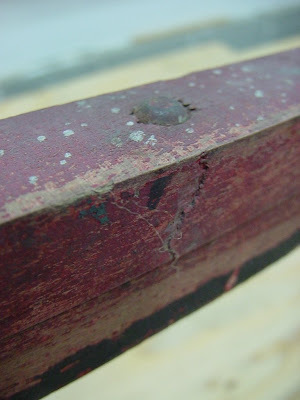 If allowed to continue it would return to raw materials (in this case rust and rotten wood, which I suppose ultimately would just become dirt...). But, if I intervene - with a little elbow grease, mineral oil and beeswax a surprising amount of order is reestablished and the tool lives again! 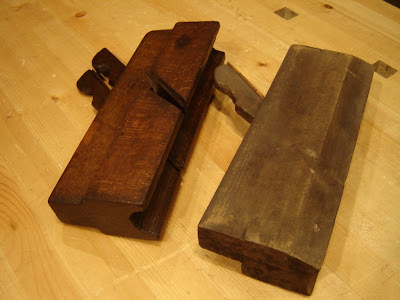 Here's an example: nosing plane (traditionally used to put a rounded front edge on stair treads) as found with dirt galore and not one but two colors of paint dripped and/or spread on it. Note the incorrect placement of the wedge and iron on the near side. Did someone use it that way? After a gentle cleaning with rubbing alcohol (not what you will usually see talked about, most people seem to use mineral spirits/paint thinner, but I prefer the less toxic stuff whenever possible, and it seems to work - I use the 99% stuff from Safeway) a good dose of mineral oil and a final application of my own beeswax paste (beeswax melted into mineral oil) the life returns into this old tool. Foolishly, I didn't take a before and after photo of the other side of the plane, where the transformation was striking. You'll just have to trust me that before the cleaning, the plane looked almost identical to the other old plane in the following picture. None of the beech rays were visible in the uncleaned state - but boy did they jump out after! I haven't really returned this plane to a fully usable state - the irons are waiting for their turn over at the Scary Sharp bench. I don't really consider the order restored until the first shavings are leaping out. At which time, I always stop and ask, just how long has it been? And what have you been doing all that time? Are you glad to be back? They haven't answered outloud yet - so I guess I am okay after all.